Best Form has put together this workout pants guide to help fitness enthusiasts find the right bodybuilding clothing for their individual needs. A roomy cut in the thighs with a tapered ankle are characteristics of these popular workout pants. Best Form F500, Crazee Wear C500 and CMPPJ, and the G500 Golds Gym pants are available through this site. All have side pockets and an elastic waistband. The Best Form and Crazee Wear pants are both 100% cotton while the Golds are a 50/50 cotton/poly blend. They’re also great casual wear to wear while you’re out and about. Best Form carries both the World and Golds Gym sweat pants which use the same, identical blanks, only the screen-prints differ. They’re made from a 50/50 cotton / poly fleece. An elastic waistband with a draw cord allows for a comfortable, adjustable fit. They ankles taper sharply and have elastic band cuffs. There are no pockets, these gym pants are designed for workouts but also are great for wearing around the house. 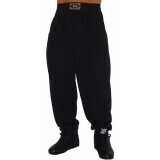 For those wanting something with more of a wider ankle cut the Golds Gym Karate Pants will satisfy that desire. 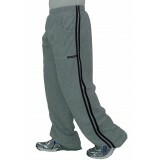 Like the baggy gym style workout pants these also have a two inch elastic waistband, additionally it has a draw cord. The G503 are made from a 50/50 cotton/poly blend fabric. The G504 Karate pants are made from 100% Polyester. If over average waist size go the next size up.